... that come with standard PC's aren't fit for music production. You need to look at computer sound cards or audio interfaces with a bit more, shall we say, oomph! Why not just use the sound card which comes with the PC? The sound card in your PC was not designed with musicians, sound engineers and music producers in mind. ... because this little guide will make your choices slightly easier. You make one of your most important purchases when you decide to buy a pro sound card to make your own music with. There are many factors involved in choosing the right sound card for your home music studio, which means you'll need to do some serious research before you buy. You can use this page as a place to start off, and not as a full-blown guide to computer sound cards and audio interfaces (which can be a topic for a whole new site), so you can't blame me when things go down wrong with your sound card choice. I just provide the most helpful information I can, and you do the research you require! Sharp? Sharp OK then! What do computer sound cards or audio interfaces do? Basically, your sound card takes signals from outside your computer and puts them inside, and vice-versa. Your sound card or audio interface takes analogue audio signals (microphone, instrument or turntable outputs), and converts it to digital audio signals computers like and understand. This allows you to record your audio on your PC or Mac using recording software. Computer sound cards or audio interfaces can also take recorded digital audio signals from your computer, convert it to analogue audio signals, and output the converted signal to your monitors (pro audio speakers), mixing desk, processors and other stomp-boxes and toys. The above two processes are referred to by men in white coats as Analogue-to-Digital (A/D), or Digital-to-Analogue (D/A) conversion. 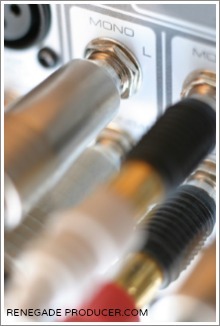 The quality of your conversion depends on the quality of the Digital Audio Converters (on your sound card) and on your audio drivers (software which comes with computer sound cards). Process in an A/D converter which measures and captures the amplitude of an analogue sound wave many times per second. Each sample consists of many levels of audio energy which is measured and expressed in bits (binary digits). The higher the bit depth number, the more levels per sample, the higher the quality. Number of times per second the audio waveform is sampled by the A/D converter. The higher the sample rate, the higher the quality. So dropping all the technical stuff, what bit depth and sample rate should you look for in computer sound cards? 16-bit / 44.1 kHz is CD quality, though you'd be better off going for 24-bit / 44.1 kHz for your sound card or audio interface (even when it will go back to 16-bit on CD). With 24-bit / 192 kHz sound card you're completely sussed and sorted for whatever music you want to create, as long as your you have tons of hard disk storage space (because higher audio resolution means more space needed for your audio files). The software drivers are basically just some very important software codes which manage the flow of information between your computer CPU and your sound cards Digital Audio Converters. The information needs to be sorted and managed in such a way so your software sequencer application (Cubase, Sonar, Logic etc.) gets the audio information at the right time, and quickly. The company who produces your sound card or audio interface updates the drivers on a regular basis and makes the updates available on their web sites so you can download. ... the drivers of your sound card is compatible with your computers operating system (Windows, Mac OS etc.). ... the drivers will work with your chosen music production software program (Cubase, Logic, Sonar, Acid, Pro Tools etc.). Pro quality D/A or A/D converters with bad quality drivers mean bad sound quality. So research carefully when it comes to your choice between the different computer sound cards. USB (Try to avoid as far as possible as it may cause "issues" with your audio production. Use USB2.0 if you absolutely must). Update: USB interfaces have come a long way since I first wrote this post and quite a few have become pretty decent. USB 3.0 interfaces are now also available. Which music creation software do I want to use with my sound card? Your sound card or audio interface and the recording software program you use (Cubase, Logic, Sonar, FL Studio etc.) need to be compatible. Check the "System Requirements" on the music production software package you want to use, then check the "Technical Specifications" for the software driver type of the sound card you choose to make music with. ASIO, WDM, DirectX, MME, Core Audio, MAS, DAE, Pro Tools LE and Pro Tools M-Powered. You simply want to make sure the driver type required by your music production program is the driver type of your sound card or audio interface you purchase. How many inputs/outputs do I need on my sound card to make my own music the way I intend to? One pair of stereo inputs/outputs may do you well when all you want to do is record a single instrument at a time. You'll need more in/outs for recording more instruments at once. You want to also consider how much you want to expand your home music studio in the (near) future. More in/outs may not be vital to start off with, though more just seems much better when buying a piece of gear as vital as your sound card. What's my budget for a sound card or audio interface? You now know the sound card or audio interface you choose to make your own music with can make or break your sound quality, so be prepared to pay for what you get. Save money on other things, not your sound card or audio interface. You want the best you can afford and nothing less. Do you have a tight budget? Want to get started now? The Steinberg UR44 is solid choice. Price is not an issue and you want quality sound and flexibility? Look no further than the RME Fireface UCX.